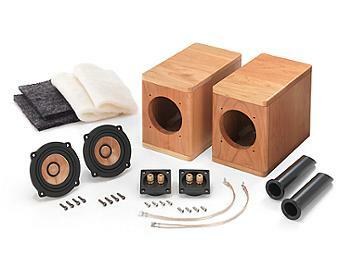 JVC (Victor) Wood Cone Speaker Kit has everything you need to assemble your own cherry wood cabinet speakers. Based on its predecessor "EX-A1", the SX-WD1KT model uses a 8.5cm full-range speaker with a wooden cone, the enclosure uses a bass-reflex design made from natural cherry wood unfinished (sub treatment only). It measures 120x160x233mm and weighs 1.6kg (speaker include).